Moses was instructed by the Lord to send 12 men into the land of Canaan, to explore it, and bring back a report. 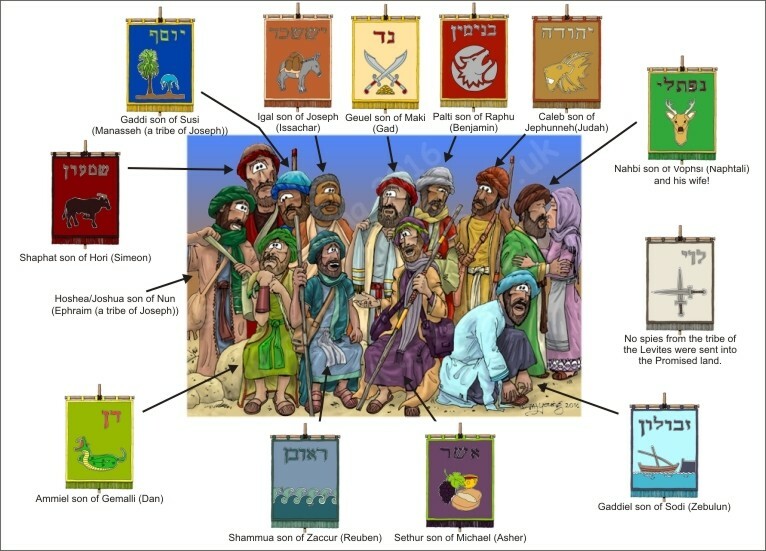 Each of the men selected to spy out the land was a leader of his tribe – the 12 groups that formed the Hebrew nation, named after the 12 sons of Jacob/Israel: Reuben, Simeon, Levi, Judah, Dan, Naphtali, Gad, Asher, Issachar, Zebulun, Joseph & Benjamin. The only slight complication to this arrangement is that Joseph is represented by his 2 sons: Ephraim & Manasseh. In the picture above you can see the 12 leaders identified, surrounded by the tribal banners that I used to determine the colour of each of their robes. 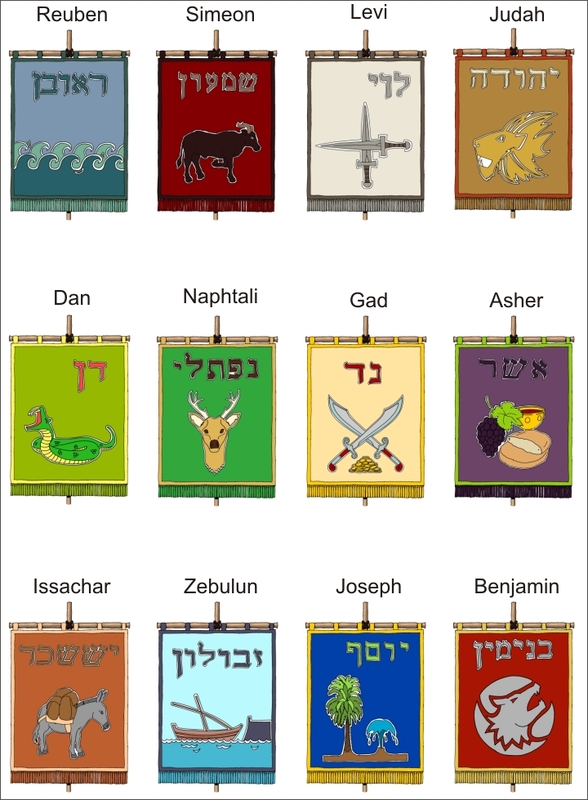 I have already designed the tribal banners of these 12 sons of Jacob. The costume of each of the 12 spies is based on the colours I used for these tribal banners. I created each sons costume & therefore each tribal banner, by referring to Jacob’s prophetic words, which are recorded in Genesis chapter 49. In that text, Jacob blesses his sons, & the text describes each son. From this text I have designed each son’s clothing, & also the tribal banner that bears that son’s name. If you scroll down below the picture you will find a description of each son’s clothing colours & the tribal banner design & colours. The tribal banners of the Hebrew nation. 17 When Moses sent them to explore Canaan, he said, “Go up through the Negev and on into the hill country. 18 See what the land is like and whether the people who live there are strong or weak, few or many. 19 What kind of land do they live in? Is it good or bad? What kind of towns do they live in? Are they unwalled or fortified?